I have a hefty notebook full of exciting ideas for Palindrome Dry Goods this year and I'm excited to start producing new posts for y'all. 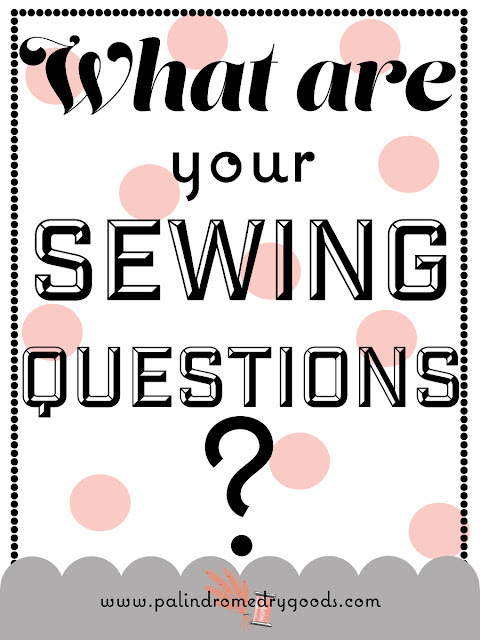 However, before I begin writing, I wanted to hear it straight from all of you: what sewing questions do you have? What techniques are you interested in learning? What sewing challenges are you trying to overcome? I'd love to produce custom-fit content for you, my awesome readers. If you haven't already, be sure to check out this year's Sewcabulary series (more coming soon!). In these posts basic sewing tools, and techniques, are thoroughly covered. Each post is beautifully photographed to help you see each and every step. I highly encourage readers to ask questions about each post so I can help you understand more! Also, because it's a new year, let's start off on the right foot and clean our sewing machines. I've written detailed, step-by-step, directions to help you get that little sewing machine oiled and ready for this year's projects! I'm so excited to see what questions you have and what topics you'd like help with. It's going to be a good year, everyone. Here's to us and conquering challenges! Do you know a good way to service a serger at home? My older serger has a tendency to gum up if not used frequently. All of my machines get used quite a bit(I costume for a ballet school) so I'm very excited for your sewing machine servicing post! That will definitely save me $$! Thank you for commenting. Well, unfortunately, I cannot be very helpful when it comes to this question. I have a combined total of about 6 hours of sewing experience on a serger. Do you have the manual for it? Your manual may have a 'servicing' section where it will tell you to put oil, or what parts of the exterior machine can be removed to be able to see inside the machine. I hope you'll use my servicing post for your other machines, and if you have questions about it, feel free to ask them! Happy sewing. SUCH a good request, miss Kristina. I'll try to make it happen! I've bookmarked this page so that whenever any video tutorial is posted, I get to know. Nice work. When I was in junior high school 1971-1973 we did a pillow cover project.....we drew a square grid with pencil and then sewed opposite corners of squares. I CANNOT remember what it was called...can ANYONE HELP???? Hey there! I'm going to guess here, but I think perhaps you made a smocked pillow. Check out the images here to see if it's what I'm thinking it is. https://bit.ly/2HZ7Nsg I hope that helps!